The title is almost an invitation that welcomes us: to gather all together around the Teatro Sistina to restore passion, optimism and serenity to the public. After the great consensus obtained with My Fair Lady, the beloved couple of the Italian Musical is back, composed by Luca Ward and Vittoria Belvedere. Teatro Sistina – which in the past season celebrated the films Seven Brides for Seven Brothers and Jesus Christ Superstar – celebrates another anniversary of one of the most beloved music movies of all time, in the 50th anniversary of its release in cinemas . The film masterfully interpreted by Julie Andrews came out in theaters in 1965 and since then remains one of the classics that are handed down from mother to daughter. Three generations have sung Do-re-mi with their children and even today this Musical can succeed in the mission of bringing families together at the theater. 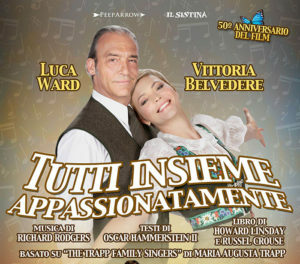 Luca Ward will give voice and body to the rigid military Von Trapp, the widower of seven children who, as in every fairy tale with a happy ending, will be softened and then tamed by the sweetness to which he will give all his vigor an ever more mature for the Musical, Vittoria Belvedere. With them on stage 7 children aged 17 to 4 years.